This is a useful product in that it fulfills two purposes. 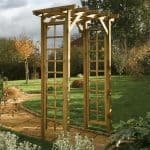 Firstly, it gives you a wonderfully attractive arch for your garden. 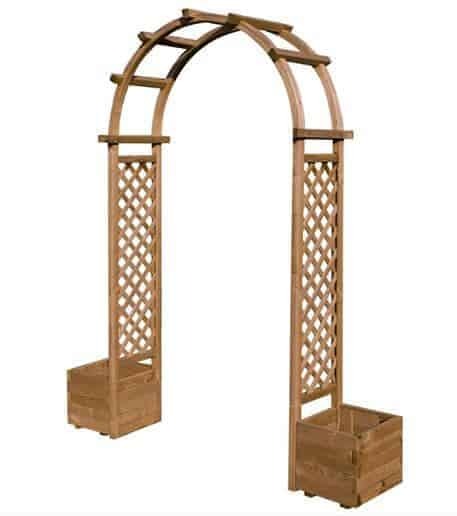 The arch is pretty, and has exquisite trellis work up the sides. 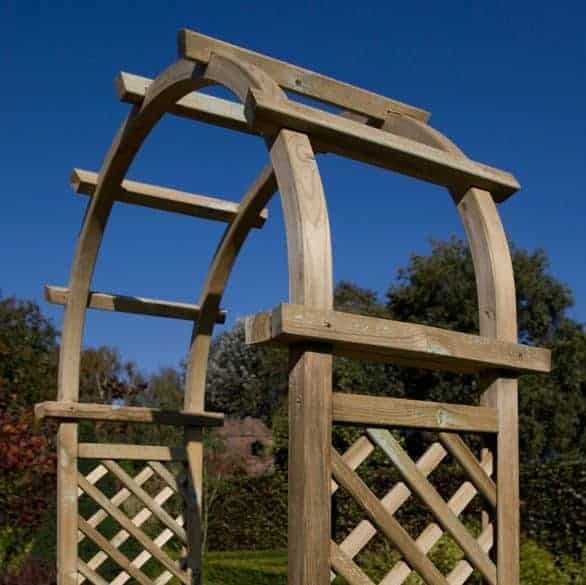 At the same time, the second function comes into play with the arch also having two good-sized planters either side of the base. 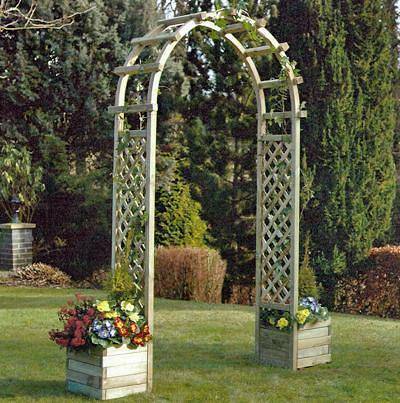 You get the versatility and usefulness of planters, and the beauty of the lovely-looking arch. 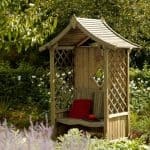 It’s well-built, and we like the fact that the trellis work is intricate, but not forbidding if you want to trail some plants up the side of the unit. And there is a lot to be said for the price here too. For something that is so hard-wearing and well-made, it has a surprisingly low price. You need to have two people to build this arch. This is due to the weight of the construction and the complexity of the build. It shouldn’t take long to be installed and full instructions are given. In addition, all fixings are supplied too. It may look a little flimsy but it’s heavy. in addition, it also has pressure treated timber pieces. These pressure treated pieces mean that you don’t have to treat it every year for rot. This is a major labour-saver, and it also stops the unit from falling apart as well as making it generally more robust. Yes, and it’s a healthy guarantee, lasting 10 years against damp and rot. Be sure to follow the care instructions that are given so you don’t void the guarantee and you should be okay. 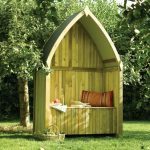 Rowlinson arch with planters: So what’s the quality like? This question is really answered with that pressure treatment. It stops the timber being affected by rainwater, and that is the key to the robustness and the quality of the unit. This is built to last, and it’s reassuring weighty too. This is a very attractive, and very useful arch. You get the opportunity to trail plants up the side with those planters, and we like the price, as well as the pressure treatment. I just moved in with my girlfriend and wanted to surprise her with something. She loves her garden to bits, and I decided to buy her the Rowlinson Arch with Planters, to create a beautiful entrance that really draws attention. 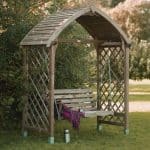 Not only is this an eye-catching feature, but it is also very useful if you have long vines like my girlfriend does in her garden, as the archway allows them to wrap around it so they can grow strong and look lovely at the same time. She’s never been happier with me, and I don’t know if I should be pleased or disappointed because she’s more excited about the archway than she is about me moving in. Aside from that, the archway is a lovely little structure which doesn’t take up too much space, or cause too much of a strain on the budget. It looks like good quality wood and I am certain it will brave any weather that nature throws at it. My wife is big on running roses, so I purchased for her birthday. I picked this one, because it had planters on the side for other flowers. She put it at the patio entrance, which makes the patio stand out more. It was a colorful addition. I purchased some white Chrysanthemums for the planters to blend in with the pink running roses. It makes for an attractive addition for a reasonable price. We have received several compliments for our decoration. It has a 15 year anti rot warranty, so I know it is a better quality product than most on the market. I want to thank the team for excellent customer service and I will be visiting the site again for my outdoor needs.